The Samsung group will present February 20 three Galaxy S10 smartphones and a fourth model that will have the distinction of offering a 5G compatibility. This variant will also have a particularly large screen because it is about a diagonal of 6.7 inches. 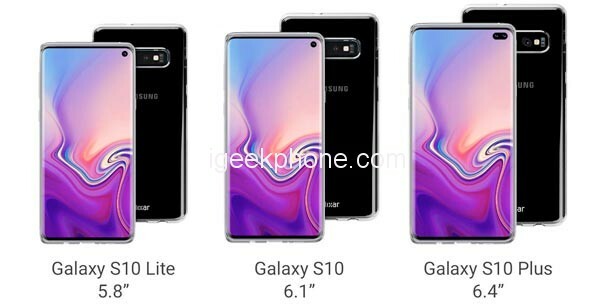 Next to the Galaxy S10 Lite, S10 and S10 +, there would be a Galaxy S10 X with Infinity-O display (pierced in the screen, with an enlarged hole for two photosensors). This model will have no less than 6 photosensors (2 in the front, 4 in the back) and could offer a high-end memory configuration with 10GB of RAM and up to 1TB of storage. This first Samsung 5G smartphone will be launched on March 29 for a price exceeding $1600 and it will be available from operators launching this year their 5G mobile network, according to the Korean site ETNews. For standard models of the Galaxy S10, still 4G, the presentation will be on February 20 and marketing is scheduled from March 8. Even in Lite version, the first Galaxy S10 should be positioned from $800, while it will take $1430 for the Galaxy S10 plus. These are just rumors that come from Korea, but you might want to start saving up money if you wish to get a new Galaxy S10 variant. The artificial intelligence part would be particularly developed on Galaxy S10 smartphones in order to offer automatisms according to the habits of the users and to propose functionalities and personalized recommendations.